Ethos Project – Ethos, the 60th largest cryptocurrency by market capitalization, is an infrastructure project that plans to create a comprehensive cryptocurrency ecosystem. Whether it be through their Universal Wallet, or blockchain research papers, this infrastructure project hopes to bring cryptocurrencies and related technologies to a worldwide stage, offering reliable services for the public. Our mission is to build a financial ecosystem that is open, safe and fair for everybody. Ethos harnesses the power of design, technology and social intelligence to create a breakthrough solution that will enable everyone to participate in the New Economy. The Universal Wallet is an innovative piece of crypto infrastructure that aims to put control and ownership back in the hands of the consumer, rather than a centralized third party. 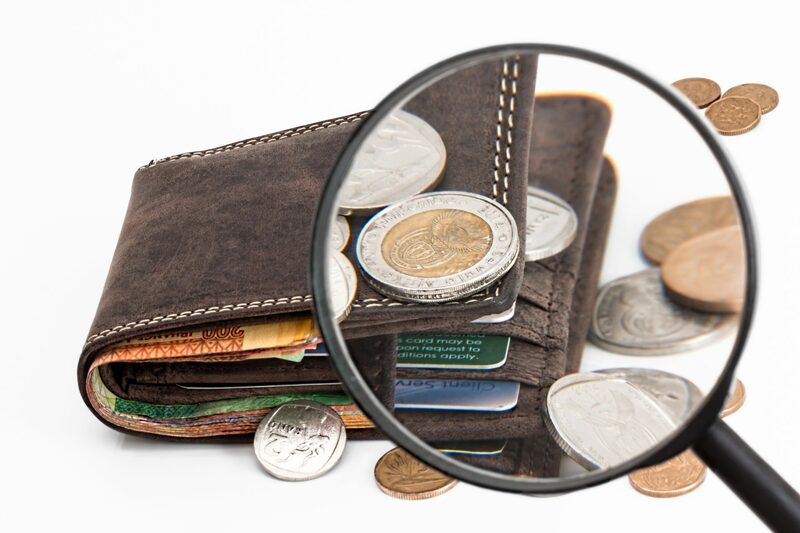 An issue with cryptocurrency wallets is that wallet operations are often routed through a centralized server, with private keys not being held in the hands of the user. This centralization in cryptocurrency storage is a slap to the face of the decentralized nature of cryptocurrencies, which is what makes this new asset class so revolutionary. Etho plans to fix this issue by introducing a variety of cryptoassets into one ‘universal’ wallet, using a single so-called SmartKey to hold ownership over all of the assets. The infrastructure project is also working on implementing cold storage options, portfolio tracking and cryptocurrency research and analysis into the Universal Wallet application. With these planned integrations, Ethos plans on becoming a one stop shop for all cryptocurrency users, introducing a variety of vital features in one easy-to-use and accessible platform. 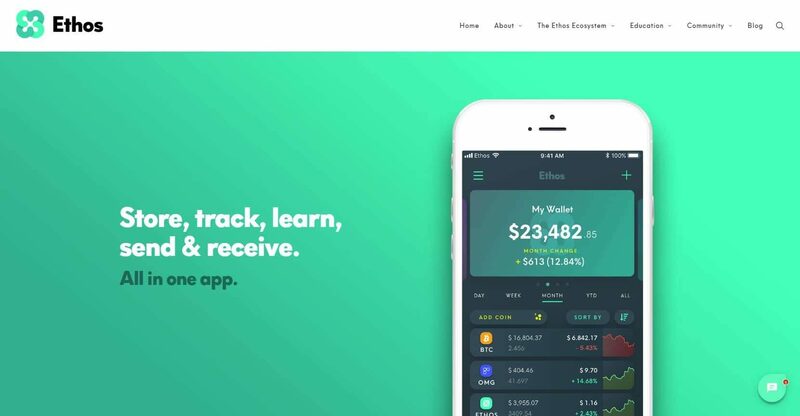 Over the past 3 days, Ethos has announced that they will begin their global roll-out process for the Universal Wallet. With the first release coming in the Netherlands on Monday, followed by Germany the day after, and most importantly, the today’s announcement for United States of America support. In an apparent gesture towards the American Independence Day, the Ethos team decided to release the Android Universal Wallet to U.S. consumers on July 4th. 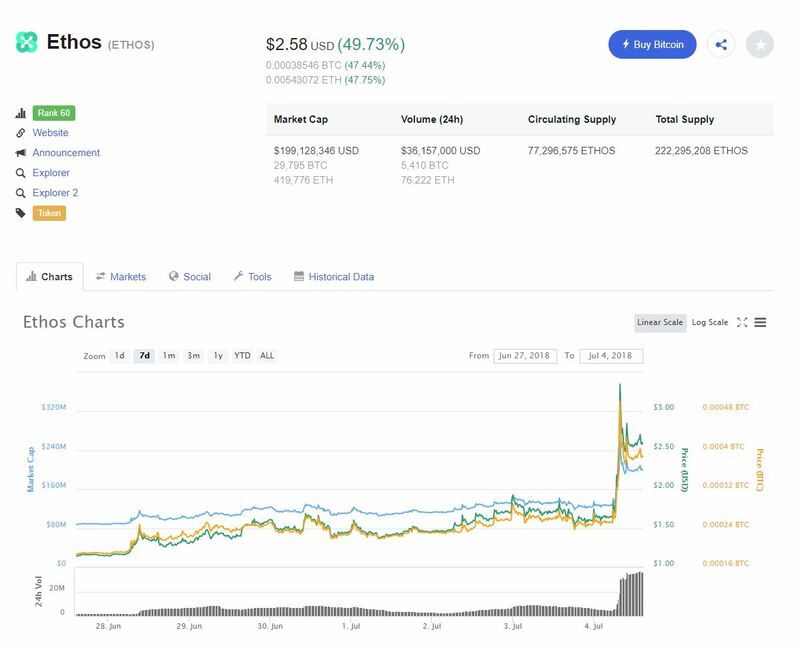 Upon the release of the U.S. announcement, the Ethos token immediately saw an influx in volume, seeing a five times increase in daily volume figures. A majority of this volume came from Bithumb, a popular exchange in the Asia cryptocurrency ecosystem. Prices on Bithumb quickly hit $3.5 in the first minutes of the price jump, but weirdly enough, other exchanges did not experience similar run-ups. Leading some to speculate that this was actually an act of price manipulation on the KRW (Korean Wan)/ETHOS trading pair, that eerily correlated with the release of the U.S. Universal Wallet announcement. Since the price jump, the average price for the token has dropped to $2.58, still posting a 50% increase on the daily chart. Volume has since slowed, with the token holding in the mid two dollar range. Although this pump may have been an act of price manipulation, the previous announcements for the Netherlands and Germany saw ETHOs take more relaxed moves upwards, signalling that Ethos prices should move upwards on Universal Wallet announcements. The Universal Wallet will be continued to rolled out to more countries, with the Ethos team holding plans for a global expansion within the upcoming months.